Tetrahedron, LLC is a non-profit educational corporation that was founded in 1978 by internationally known public health authority, Dr. Leonard G. Horowitz, to educate people around the world on matters of extreme public importance. For more than a quarter century, our growing list of offerings have endorsed taking personal responsibility for health choices, achieving optimal wellness, assuring disease prevention through positive lifestyles and risk avoidance, and keeping abreast of controversial social, economic, environmental, and political issues that pose myriad threats during this fascinating and challenging age. According to Dr. Horowitz’s latest of sixteen books, Da Vinci’s most famous drawing, “The Vitruvian Man,” is a cryptograph providing “Divine direction” for advancing technologies crucial for civilization’s evolution. The actual code that sparked Da Vinci’s creative genius, not mentioned in The Da Vinci Code by Dan Brown or film by Ron Howard, is a set of mathematical-musical notes, numbers, and symbols that heralds civilization's capacity for Divine-human communion. 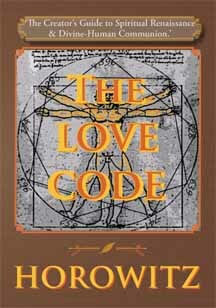 The real secreted code also directs the development of new technologies that can accomplish most amazing and desirable outcomes in the arts and sciences for humanity's physical salvation and spiritual evolution. 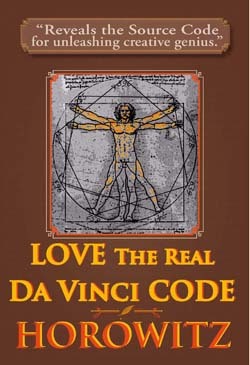 LOVE The Real Da Vinci Code provides unprecedented insight into Da Vinci’s reversed-writings, notebook encryptions, and famous Vitruvian drawing that has become the icon for natural living and holistic healing movements. A historic presentation before the American Association of Naturopathic Physicians by Dr. Horowitz, author of more than 15 books, including the national bestseller, Emerging Viruses: AIDS & Ebola—Nature, Accident or Intentional? In this riveting presentation, Dr. Leonard Horowitz relays more than a decade of his research evidencing nefarious tinkering with microbial, plant, animal, and human biology befitting a massive conspiracy to place profits before people and population control before compassionate medicine. 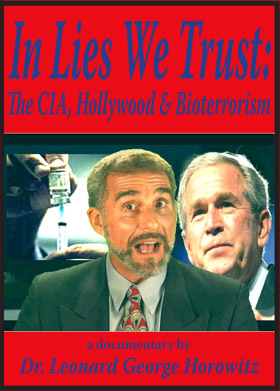 Dr. Horowitz presents solid proof that the most powerful industry on earth—the petrochemical–pharmaceutical cartel—aided by corruption, greed, and incompetence by officials in government, scientific organizations, and academic institutions, has seriously endangered the life and health of myriad forms on this chemically and pharmaceutically beleaguered planet. As documented in his national bestseller (cited above), and in his scientific text, DNA: Pirates of the Sacred Spiral (Tetrahedron; 1-888-508-4787), Dr. Horowitz documents the man-made sources of the world’s most deadly viruses and catastrophic illnesses. He evidences, like no one has ever done, academic and political malfeasance and fraud in public health and modern medicine afflicting the world’s populations. In fact, the massive killing and injuring of people through contaminated vaccines, intoxicated blood-supplies, injurious drugs, poisoned waters, polluted airways, dangerous chemicals, and genetically modified foods is best defined as genocide, as all of this is conducted and rationalized for profit and political expedience. Examples provided by Dr. Horowitz in this historic lecture include: the origin of AIDS from corporate labs to gay Americans and Black Africans through experimental hepatitis B vaccines administered during the early 1970s; exploding cancer rates that were predicted and expedited due to recklessly irresponsible health officials protecting their jobs and grants; heart disease scams perpetrated upon the unsuspecting miseducated masses; unprecedented new flu-like illnesses involving military laboratories developed for profit and population control; new immune suppressive germs and chemical co-factors developed and released to prompt Gulf War-like illnesses long before the first Iraqi invasion; and diabetic pandemics linked to insulin production by genetically modified yeast spread environmentally and through our current food supplies. Dr. Horowitz provides these examples and more as an urgent plea for a return to scientific integrity and human sanity in this graphic and unparalleled lecture DVD. Description: Based on the latest science, this monumental book considers both uses and abuses of DNA--"The Sacred Spiral." Stunning evidence compiled herein proves DNA is nature's bioaccoustic and electromagnetic (that is, "spiritual") energy receiver, signal transformer, and quantum sound and light transmitter. In other words, the bioenergetics of genetics precipitates life. These scientific revelations bring expanded spiritual meaning to life, physical embodiment, and even evolution. Yet, leading genetic industrialists prefer to keep these uplifting and freeing truths secret. The infamous untrustworthy "Human Genome Pirates" operate covertly, controlling genetic patents, spin-off technologies, and public information dissemination. With the world's most powerful banking and pharmaceutical cartel behind them, they now control civilization's destiny. The greatest risk of manipulation and threatened extinction is at hand. As humanity teeters on the brink of unprecedented DNA-mediated, spiritual ascendance or complete enslavement if not extinction, argues award winning author and public health expert, Dr. Leonard Horowitz, this riveting prose provides critical direction for humanity's physical and spiritual salvation. This book offers revolutionary new views of emerging genetic research consistent with largely secreted science and sacred spiritual knowledge. Chapters incorporated this metaphysical science non-fiction thriller include discussions of electro-genetics, quantum physics, bioholography, human consciousness, and even spiritual dynamics, to accomplish an urgent mission: awaken humanity to the highest levels of risk awareness and accountability for our planet's destiny. Dr. Leonard Horowitz provides an unparalleled peek into the Creator’s technology. He unearths compelling scientific evidence of your spiritual existence, and gives practical advice for your success as a powerful co-creator. Learn to be open-hearted, optimally blessed, and Divinely directed and protected as dramatic changes are unfolding globally. This spiritually uplifting book will have you celebrating and powerfully contributing to the Spiritual Renaissance as modern life is being transformed worldwide, and people like you are doing their part in preparation for a millennium of world peace. If you are interested in alternative medicine, metaphysics, music, simple mathematics, chanting, or praying, Dr. Horowitz relays great news. Walk on Water “opens doors that no man can close” regarding your spirituality, unity with Divine family, and the importance of your family and community for personal development, spiritual evolution, and planetary salvation. THIS BOOK MONUMENTALLY PRESENTS THE WISDOM OF "INTELLIGENT DESIGN" VERSUS THE LUNACY OF CHEMICAL TOXICITY, PHARMACEUTICAL SORCERY, AND EVOLUTION OF THE SPECIES. In the wake of the Sept. 11, 2001 terrorist attacks on America, and the pending “Space Preservation Act of 2002” (H.R. 3616), this prophetically titled masterpiece is MUST AND URGENT READING! 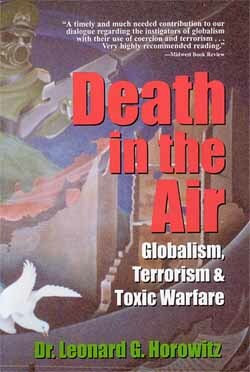 By giving you the full background and complete picture of who funds global terrorist organizations AND space based-weapons, and for what demonic purposes, Dr. Horowitz's latest book may help save the planet and millions of lives. Released in June 2001, this award-winning author's predictions have now come true. Coming soon is biowarfare, increasing global plagues, nuclear threats, more massive droughts and earthquakes, and population control technologies operated from space and effective beyond your wildest nightmares. 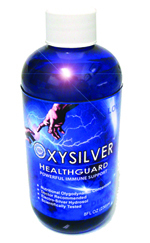 Will you be prepared with the intelligence you and your loved ones need to survive? For beginners, this book is a crash course and reality check. For seasoned preparedness and conspiracy buffs, here is your next level, urgent lessons, and stunning documentation! Again, this intelligence may be crucial to you and your family's physical and spiritual survival. Order it Now!